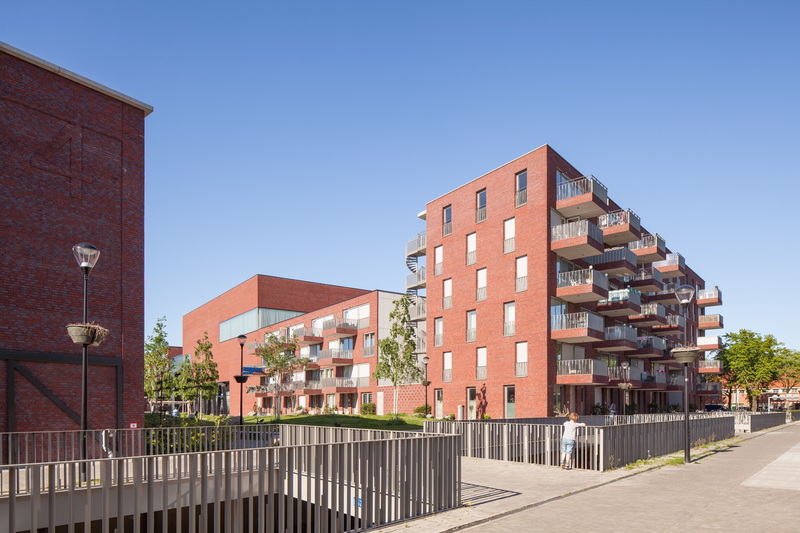 The redevelopment of Hilversum, in the Netherlands, sees the participation of Mecanoo architecten in Villa Industria, a new residential district on the former industrial site of REGEV. The new residential tower blocks in Villa Industria are inspired by gasometers. In the early years of the new millennium, two privately owned Dutch companies held a contest for redevelopment of an urban area to the east of the centre of Hilversum, about forty kilometres from Amsterdam. Mecanoo architecten won the contest, which led to the conception of an overall plan for transformation of the former REGEV industrial site used for gas storage to a residential district with the emblematic name Villa Industria. Hilversum’s recent past saw strong urban growth beginning in the early decades of the last century, and in 1918 the local authorities appointed their architect to come up with a new city development plan. Willem Marinus Dudok came up with a plan and designed a number of public buildings, including the famous town hall, schools, the cemetery, the slaughterhouse and a number of residential districts. Influenced by the Organic Architecture movement, he imitated and went beyond the work of Berlage and the Dutch Constructivist tradition, giving the town of Hilversum a rigorous, unified image. The centre grew according to Dudok’s plan in the decades that followed, maintaining a protected forest belt around the town, which was however seen as a limitation that caused a lack of interest in real estate development toward the end of the century. This historic development combined with a series of infrastructure issues significantly reduced the population of Hilversum. Redevelopment of the town centre for commercial and entertainment purposes, expansion of the railway station, and construction of the Netherlands Institute for Sound and Vision, making Hilversum the Dutch capital of media and technology, have recently drawn attention to the city once again. This is where the plan for Villa Industria comes in, created by Mecanoo architecten for a real estate developer and a builder on the site of the abandoned gasometers: this big vacant space in the city preserves only the typical steel trellises of the gas storage facility, a local landmark in Hilversum, now considered industrial archaeology. The wish to preserve this historic memory inspired Mecanoo to come up with a masterplan for 357 homes – partly affordable housing, partly townhouses and bungalows, plus a number of small shops and sports facilities – using a layout and materials inspired by the typological references of the original industrial site. Located between Lorentzweg and Minckelersstraat, which merge into a single street connecting the district with the town centre, passing below the railway lines, the masterplan presents a series of well-defined areas separated by large green spaces, following the example of garden cities. The architects clearly distinguish between the different routes, allocating the area above ground to pedestrians and cyclists and keeping cars in the underground parking lots: in short, they give priority to environmental considerations, rather than merely functional matters and comfort. The railway line that linked all the buildings and gasometers in the old industrial complex becomes a street for vehicle traffic positioned below street level. Constructions such as the gasometer or the warehouse with the gabled roof may be recognised in the new residential constructions as pure formal allusions, with no correspondence in terms of volumes and footprint. The three new residential tower blocks allude to the old gas towers, with a rectangular layout set within the circular metal cage, adding the surface area of the patios to the space available for each unit. Between the public spaces of the parks and the private spaces of the homes are semi-public green areas which not only act as a filter but give each residential unit potential for customisation. The primary material is brick, used to unite all the blocks, but with different decorative details depending on the block in question, making them stand out in the neighbourhood. Widespread use of brick is traditional in the Netherlands, with the addition, here, of steel and above all glass, offering views over the landscape.